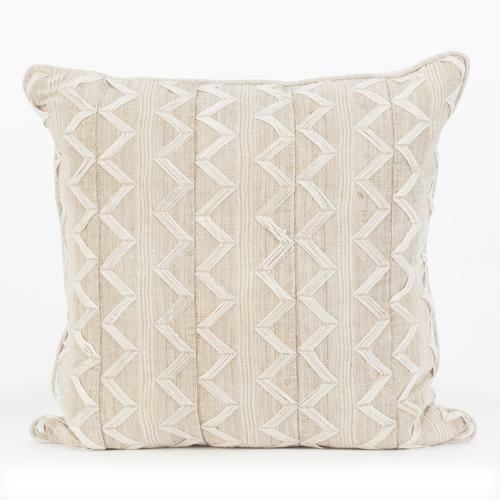 These cushions are made from a wonderful mid century Yoruba strip-weave with a floating supplementary weft zig-zag stitch. These are very hard to find now, and this is the first of these type that I've had in 6 years. I love this strip-weave as it is a grey rather than a brown tone which I favour and the colour is made of a mix of greys and browns from the threads which are homespun cotton and wild silk. The wild silk also lends a lovely slubby texture. The cushions are backed with vintage hemp, have piped edges, zip closure and feather pads. There are 5 available and some fabric for further quantities if required.